That title sounds like a financial blog. Which this isn't. It's not even really an "organizational" blog, unless maybe it fits in the "Organization for the Terminally Disorganized" category. Because I am. Terminally disorganized, I mean. And I'm a Virgo. Go figure. I guess that means I want to be organized. But if it happens, it doesn't happen for very long. I have a spreadsheet I've prepared for the e-publishing I'm planning to do. Here's hoping I remember to put things into it for more than a month or so. I figure I'll be obsessive about keeping track of my sales for a week or two, and after that... Phhhtttt. I figure I'll be filling it frantically in when the fella informs me that I need to give him some info for the taxes. That's usually how I go. In spurts. I seem to do pretty much everything in spurts. Which, I suppose is my point. I can work with spurts. As long as I keep coming back to these things I want/need to do, and do them, I can get the things done that I want to get done. I like that "15-minutes at a time" thing that the FlyLady recommends. I can do anything for 15 minutes. Problem is--I usually forget to set the dang timer. But I keep coming back. I've been "spurting"-- okay, sprinting in the writing. It's how I've made it to DAY 13 (!!!) of my 100 day challenge. I haven't made it much past Day 20, ever, yet. (You see what I mean about spurts?) But I keep coming back to it and starting again. The book is getting written. I didn't go out and walk yesterday, even though it would have been my walking day. I meant to go, but I didn't. (I meant to do a lot of things yesterday, and didn't. Sigh.) So I went today, and I'll go again tomorrow. I got back to it. That's the secret. Just keep going back. If you slip up, get back into it. Keep showing up. That said, I walked all the way to 45th Street today--a mile, one way, from my house. That may not sound impressive, but I'm closer to 60 than 50, and I'm fat. I'm impressed with myself, so there. I passed the new Fort Crockett park, where the dolphin sculpture is. I did look at the painted dolphins, and that's completely new cement. They couldn't really do anything with the old cement. The dolphins are painted in the exact same colors, same design. They look great. Today, I wrote a bio for the e-pub books I have planned. Why does it take so much longer to write this kind of stuff than it does to write story? I also wrote cover copy/descriptions for the first one of the books. I'm getting friends to help me with it. But it's progress. AND, it is DAY 8 (right?) on my writing challenge. I didn't get as much written as I'd hoped, because the boy was awake this a.m. and kept wanting to show me stuff. He did finally get the hint. 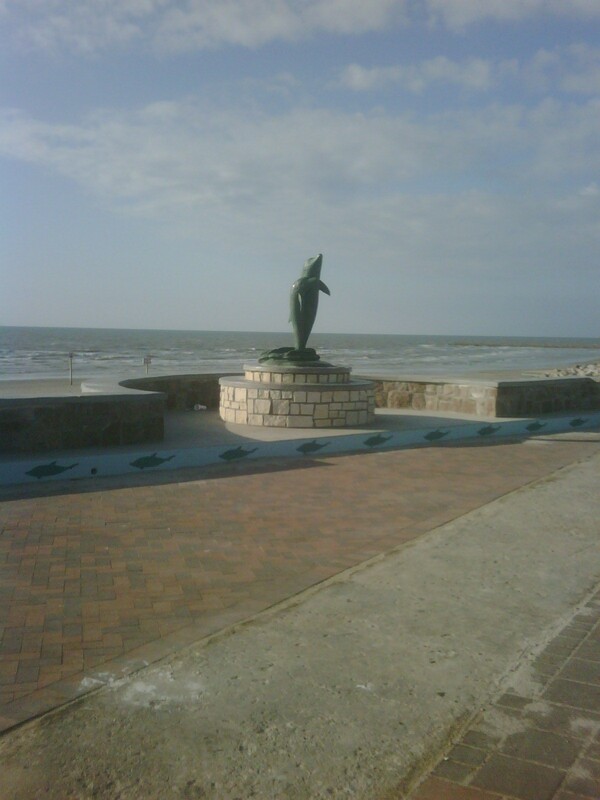 I also got started late with my writing projects, because I went out for a walk this a.m. and walked all the way down to the dolphin statue. It looks MUCH better now than it used to. Frito-Lay donated a bunch of money to fix up the little seawall park there where the dolphin statue is. 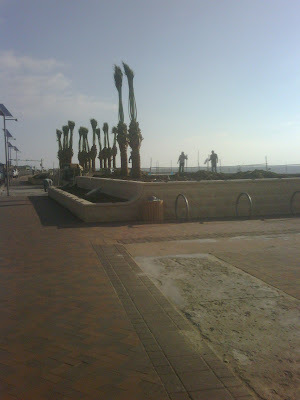 They've rebuilt the plaza, put in a bunch of planters and benches and solar-power lights and stuff, and will build a big shade pavilion once all the palm trees and plants are in the planter. The summer after Hurricane Ike (remember that one? No? Yeah, well, Lehman Brothers went bankrupt the Monday after Ike hit on Saturday...) it looked really beat up. 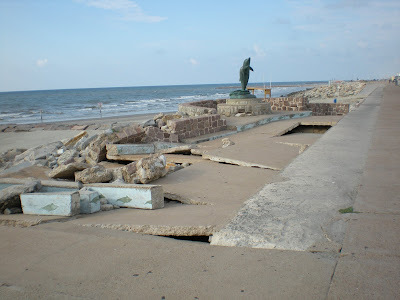 The storm surge washed all the sand and stuff out from under the concrete and beat it all to heck. I don't know if they poured and painted new concrete for the dolphin mural, or put back and repaired and touched up the old stuff. I looked today, while I was out, and really couldn't tell. Well, one of those nights, one of our number rose in the darkness and ventured to the facilities, using her cell phone as a flashlight to light her way so she wouldn't trip over something and kill herself, and when she got into the restroom, she saw something black and scary on the floor. She didn't have her glasses on (as mentioned, we are of a certain age, and all near-sighted), the phone light was mostly dim, and she couldn't reach the light switch to turn on the real light and see what in blazes it was. Especially since she was pretty sure it was a rat. She crept forward, holding the phone out toward the rat, while reaching with the other hand for the light--which was on the other side of the room near the other door--until finally the other one of us (who wasn't me, because I was asleep) informed her that it was my sock. I thought I had retrieved all of my clothes when I got into my nightgown, but apparently, one of my socks got away and stayed behind to play Halloween games. My friend picked it up and tossed it out of the bathroom. I think she was trying to put it with my stuff, but the next morning, it was next to one of the support posts. Maybe it crawled over there. I picked it up and put it in my suitcase...and an hour or so later, I saw it on the floor again. That sock was determined to escape! It didn't stay put until I stuffed it down in a pocket and zipped it closed. I hope I got home with it. 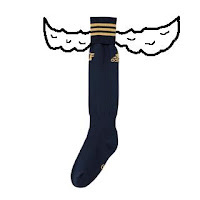 But we had a good laugh about how scared D was about that wayward sock. I am making progress in my self-publishing venture. Yes, I will put up Heart's Magic when I get the rights to it--unless Tor actually decides to publish it. I am also doing a contemporary romance with no fantasy whatsoever in it--Knight in Black Leather--and a contemporary-set fantasy romance with a hero who comes from an alternate world--Heart of Stone. After that, I'm not sure what I'm going to do. It all depends on what I have, what I write, what I want to write... We will see. I am on DAY 7 of my challenge. Got 4 pages written, and the fella came home to pack an ice chest for his trip to Austin, and wanted to converse, of all things. So I stopped sprinting. The guys moved my bookcase out of the closet in my office while I was away, and moved a gun safe in. The fella doesn't like my bookcase where they put it. All my books are now in boxes, stacked in the floor in here. I am not happy. I'm not mad, or even upset about it. I knew they were going to do it. But neither am I exactly happy about it. I'd really like to have the books more accessible, and my office less stacked up. Also, I'm trying to clean my desk off, along with all the other stuff I'm trying to do, and found two pieces of plastic that I have no idea what they are, nor what they are for. Just strangely shaped pieces of plastic. In the steps toward publishing, I have fixed my Paypal account, I think. I have my e-mails straightened out. I have about 6 e-mail accounts just now--and I upgraded my web hosting plan today. It will take a day or two to get the upgrade through, and another while for me to figure out how to make it do what I want it to do, but hopefully by next week, I'll have my website updated and I'll be ready to move on to the next step. Two HOT writers, getting ready to "sprint"
So. I went to the annual HOT (Heart of Texas) Romance Writers fall retreat last week. My writer friends and I took several days ahead of the official retreat and went out to the ranch to retreat early and get some writing done. It was great! Great to be out there with friends, great to have the chance to write, great to just think, talk and breathe writing. Not so great--the up-close-and-personal encounters with bugs, and the temperature, which wavered from too cold to too hot and couldn't really be fixed right. But bugs and heat can be endured. The pond behind the "cabin" was way down, due to the drought, and a lot of the trees had died. It was sad to see them. Hopefully, there will be some rain--before next year, please--and the creeks will come back and new trees will grow. One of the best things we did during the long weekend was "sprint" writing. We would set a timer for 20 minutes and Just Write. For 20 minutes. When the timer went off, we would see how many words we'd written, take a little break to walk around, go potty, grab more coffee, whatever, and five or so minutes later, we'd start the timer up again. I was pretty consistent. Most times, I got about 250 words. One of the ladies sometimes got 1,000 words or so--but she was at the end of her story and knew exactly what was happening, who had the POV, where she was going--she was in race mode. Sometimes, one of us would get only 57 words, or 84. Not very many at all. 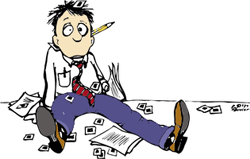 But, the important thing was that for that 20 minutes, we didn't do anything but write. We could focus, because we knew that when the bell went off, then we could check the e-mail, or look at the texts, or go to the restroom. It's not hard to put something off for 20 minutes. And it's surprising how much you can write in that length of time. I have to share the birds that have been poking around our neighborhood for the last couple of weeks. I've lived here four years now, and have never seen American white ibis (I looked them up) anywhere but out on the beach or in the marshes. But most afternoons, there they are, strolling around in the neighbors' yards, hunting for food. I assume they've left their usual haunts because of the drought, like most everything else. I am working on pulling some books together to get up on Amazon and Smashwords and B&N. Once I get the rights back to Heart's Magic (Harry and Elinor's story), I'll probably e-pub it, too, but it's a long slow process. Figuring out how to do the self-publishing is also a long, slow process, but I will get it licked! I know. I've been AWOL. First, I had company. I think. It was a long time ago. Then there was the Bastrop County fire. My parents and youngest sister and her family live in Bastrop County. 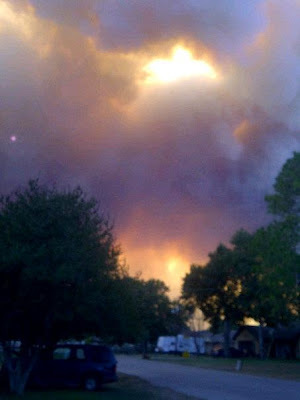 The fire was mostly closer to Bastrop, but it got pretty close. That's the view from Baby Sister's back yard during the fire. We had a really nice time, believe it or not, even though we spent a lot of time watching TV and online looking for news about the fires. Since there was a fire north of Houston at the same time, most of the local news was about that fire, but we did get the Austin stations on the internet. We worked Daddy about half to death. Tuesday, we walked him and Mama around the block. Then in the afternoon, we made him walk down to the beach with us. It's not but about 2-1/2 blocks, but this is a man who gets up in the morning, eats breakfast, takes a nap, eats lunch, takes another nap, eats dinner, and goes to bed after watching a little TV. He's still skinny as a rail. And he took a nap on the beach. (We had some big beach towels spread out, so he didn't get too sandy.) I went out in the water with the kids. Laura and her 21-year-old daughter Molly hung on to Mama so she could stand in the surf without getting knocked over--that surf just washes the sand right out from under your feet, besides being surfy and shoving at you. That's pretty much all the excitement we've had. I'm trying to get some writing done. Trying to get my "independent publishing" stuff set up. (Argghh!) Every time I think I'm ready to upload a story, I realize there's something else I need to get ready first. I keep backing up, and backing up... It's just craziness. Now that the heat has finally sort of moderated (It's still reaching the high 80s to low 90s pretty much every day), I'm walking more. I even have gotten myself back into decent enough shape that I took the Dolly-dog out for a walk yesterday. She's put on a little weight, gotten herself out of shape, so that her tongue was dragging by the time we reached the halfway point, so she wasn't dragging me so much. I also found a whole angel-wing shell, about 5 inches long (okay, maybe only 4-1/2), out on the beach, and I've seen some new birds out fishing. At first I thought it was a snowy egret that was just silhouetted in the sun. But when I got a better angle on it, it was pretty much the same color as the sand. And it was jumping around and raising its wings and--well, dancing in the surf as it fished. 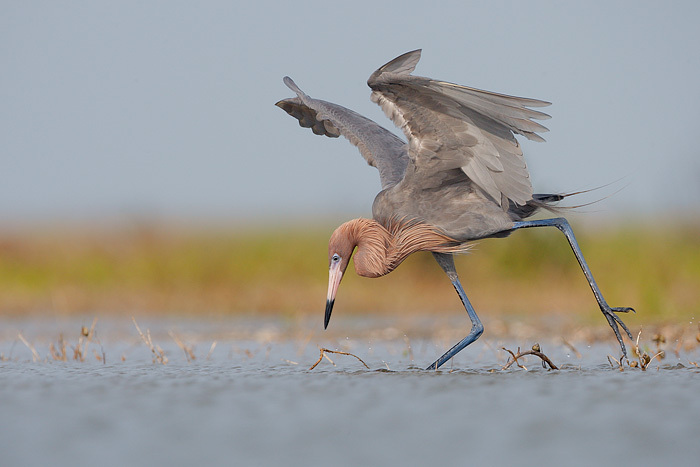 I think it was a reddish egret, going by the color and behavior mostly. Its neck wasn't that red, and I don't remember the pink on the beak--but I think the young birds aren't as red as the older ones, so maybe it was a teenager reddish egret. So, anyway, that's all the news that's not too boring. I'd swear I'll keep up better here on the blog, but I hate to swear to things I'm pretty sure I will eventually do, or not do, as the case may be. I do think about posting. I'll see something pretty, and think--"Ooh, that would be cool to share." And then I don't. Sigh, yet again.